Mostly, I worry abut people, Haylee and her best friend Willow, specifically. Haylee owns Threadville’s fabric shop, and Willow owns Threadville’s machine embroidery shop. Both of them are superb at nearly everything they undertake, including, unfortunately, getting into trouble. Both Haylee, whom I helped raise, and Willow seem like daughters to me. And those two keep poking their noses where they shouldn’t. Okay, I understand why, when Willow was suspected of murder, she had to prove she didn’t do it. How could anyone believe such a thing of her, anyway? And I understand, sort of, why when one of her top-of-the-line sewing and embroidery machines was blamed for a death, she had to clear its name, and her shop’s name. But even when they try not to involve themselves in an investigation, they somehow end up in the thick of it, and in danger, besides. Sometimes they act like they were only trying to keep me and Haylee’s other two mothers out of mischief. Right. How could I get into mischief when I’m always concerned about how much worse a situation can become? But that doesn’t mean I never picture worst-case-scenarios. What about you? Do you go through life expecting things to work out by themselves, or do you try to make things better? You can read about Willow, with a little help from her friends, solves a murder in the latest Threadville Mystery, THREAD AND BURIED, available from these booksellers. Read the first chapter here. 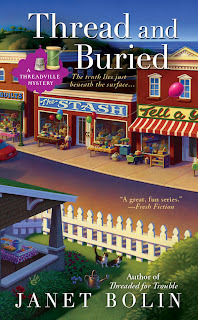 I have read the previous two Threadville mysteries and am reading Thread and Buried now. I have enjoyed this series. I do try to make things better for others, but often things will work themselves out.